The Grub Hub® stores and transports all camp kitchen gear then sets up in 3 minutes to provide tables, stove support, lantern support and organization needed for a complete campsite "HUB". It makes getting outdoors easy, fun and highly sustainable. 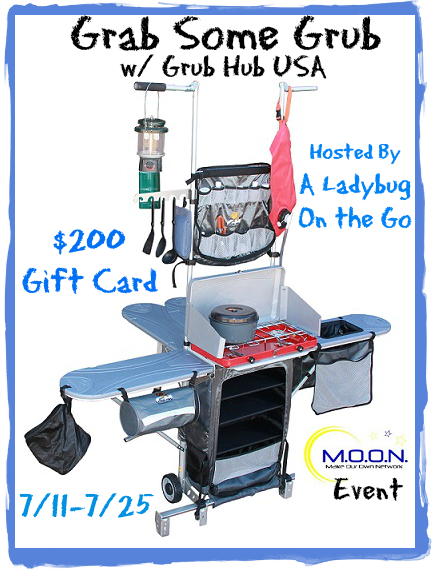 The rugged and portable construction provides over 9 square feet of integrated table space useful for food prep and cooking or other activities like tying flies, cleaning guns or sorting climbing gear. The elevated tower supports cooking utensils, lighting and gravity fed water while keeping outdoor kitchen necessities immediately at hand. The main storage compartment has three adjustable shelves and over 4500 cubic inches of space for complete gear organization. The full featured design greatly enhances outdoor sustainability by maintaining organization and making camp chores easy. It is also a very sustainable product itself. The modular construction with serviceable components and high quality materials provide a virtually unlimited lifespan. Enter below for your chance to win a $200 Grub Hub USA Gift Certificate where you can get yourself the amazing Grub Hub Camp Kitchen!!! **If you are a company and would like to see your brand advertised in a M.O.O.N. event similar to this please contact MakeOurOwnNetwork@gmail.com. This giveaway is open to the Continental US only (because of shipping costs) and will end on July 25th, 2014. Labels: Activities, Blog Frog Hop and Roll, GH-Emergency Prep, Giveaway, M.O.O.N. I love that it has a cook-top. I wouldn't just use this on camping trips, I'd probably haul it out to the back patio & use it as our regular summer-time lunch set-up! I love that the company gives back 10% to charities. That is a great and generous company!